I've read so much and so often, that I almost don't know where to begin...I've become a slacker in my original goal of being regular with this site... So, I'll start with the most recent novel that took no more than 2 days to finish (or 2 airline flights, I should say) -- The Girl with the Dragon Tattoo, by Stieg Larsson. Gentlemen, hear this: Do not be a dork and get swayed by the title, this is most definitely not a typical mystery book about a chick that fights crime. Who knew that a sophisticated suspense thriller set in freezing cold Sweden would be a creepy and twisted "delight" to page through on a ride from Florida to California? Here I was, flying from one gorgeous place to another, and I was stuck in the -6 degree weather of Stockholm and Hedestad, getting caught up in Mikael and Lisbeth's frightening and freaky moments? Kind of reminded me when I lived in St. Cloud, Minnesota...Okay, I'll admit that I was a little worried that the elderly woman sitting next to me could read some of the pages, and be slightly disturbed by the kind of person I was. For the rest of the flight, my head was bent over and my hair covered the pages. So there! What follows is a nerve-wracking, disgusting, uncomfortable trip through a magazine publisher/journalist's experience as he is initially found guilty of libel in Stockholm, is subsequently hired by an aging industry millionaire to track down his niece who disappeared 40 years before, and in the middle of this, just a short jaunt to a minimum security prison to serve out his sentence of 2 months. Oh yeah, Lisbeth is the young and emotionally non-responsive chick who has a photographic memory and is a daggone good hacker. The things she goes through...I cannot even hint as to what they are. It's definitely not G-rated. Originally written in Swedish, the English translation was done by Reg Keeland, and it is a masterpiece. That's right. A freakin' masterpiece. Here's why: Not often does a translated novel work effectively to engage a reader's interest, and this one is absolutely fabulous. Some Swedish words remain, which flow and are interpreted by the reader easily (such as gaol for jail). It ultimately creates an authentic experience that you begin to wonder what Sweden is all about. 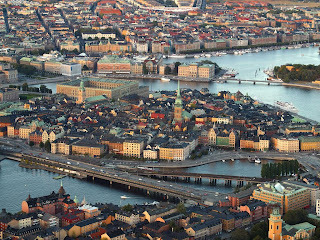 I love to travel, but I will be honest in that I never once considered visiting Sweden. Quite the contrary now. And I want to fight crime. Here's what's sad: Stieg Larsson originally planned this to be a 10-book series. He managed to complete 3 of the first 10, delivered it to his publisher, and then died from a heart attack. Based on his background in always shedding light and exposing those who are corrupt in any way in Sweden, there have been several rumors that he was killed. No one really knows, of course. But, I'll tell you what I do know...it's a flippin' shame that we won't be able to read any more novels from him. The Girl with the Dragon Tattoo starts off a trilogy of a creepy and fantastic example of suspense writing at its absolute finest. Lock the door. Leave the lights on. I'm so glad you're blogging again! I read this book and was absolutely petrified. I couldn't sleep for days, which is why I haven't picked up the other two. I want to.... but I don't know if it would be a healthy decision for me. If you read them, let me know if they are a little less disturbing. I read this book before and it's one of my favorites. I didn't know it was planned to be a series of 10 books! That's sad. It is a great book and I love Lisbeth.